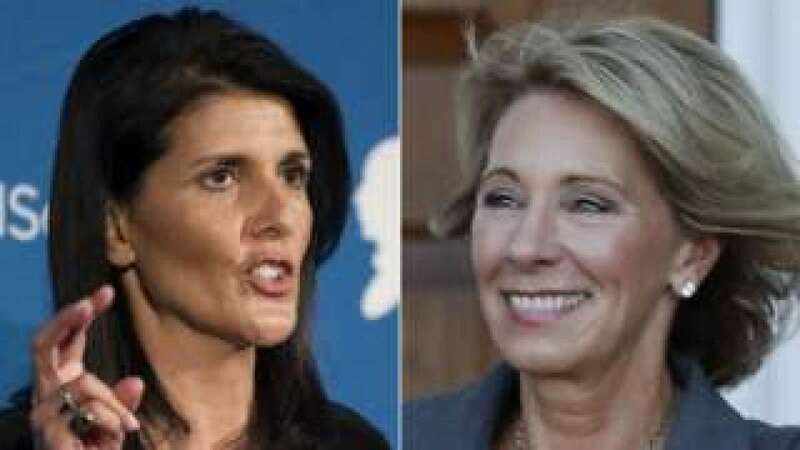 Los angeles : In a move showing support to women, President-elect Donald Trump on Tuesday picked South Carolina Governor Nikki Haley as the next US ambassador to the United Nations and also chose prominent charter school advocate Betsy DeVos from Michigan as his secretary of education. Releasing a statement, Haley said, US faces enormous challenges both at home and internationally. When the President believes you have a major contribution to make to the welfare of our nation, and to our nation's standing in the world, that is a calling that is important to heed. The second is a satisfaction with all that we have achieved in our state in the last six years and the knowledge that we are on a very strong footing." Interestingly, Haley was among the top contenders for secretary of state but now her pick leaves former New York City mayor Rudy Giuliani, former Massachusetts Gov. Mitt Romney and a handful of others still in the race for the top diplomatic position. Meanwhile, selection of DeVos faced criticism as Conservatives warned that DeVos, a longtime Republican donor, previously supported the Common Core education standards that Trump railed against during the campaign. In a statement made on Wednesday, Trump called DeVos "a brilliant and passionate education advocate. Under her leadership, we will reform the U.S. education system and break the bureaucracy that is holding our children back so that we can deliver world-class education and school choice to all families." Notably, DeVos was named one of Crain's 100 Most Influential Women in Michigan in September.